Track 'n Trade 5.0's Accounting systems allows entering deposits and making withdrawals in your trading account, as well as placing orders. By default, TNT will create a $50,000.00 deposit when first opening any new commodity list. Click on the Deposit button in the Accounting Control Panel found on the bottom of your screen. The Deposit... window will appear. 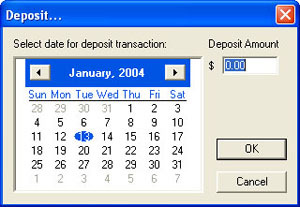 Select the day of the deposit and enter the amount. Click OK to enter deposit or Cancel to dismiss the Deposit window. Click on the Withdrawal button in the Accounting Control Panel found on the bottom of your screen. The Withdrawal... window will appear. Select the day of the withdrawal and enter the amount. Click OK to enter deposit or Cancel to dismiss the Withdrawal window. Left-click on the Deposit or Withdraw button in the Accounting Control Panel and right click the desired Deposit or Withdrawal. Select "Delete Transaction/Withdrawal" from the dropdown menu.